Nobody wants to be that coworker. You know, the one whose chair creates an ear-shattering squeal every time you lean back to down those last few Doritos crumbs. Yes, that coworker … the one with the squeaky office chair. Fortunately, the squeaks and creaks you hear every day aren’t symptoms of a chronic condition. 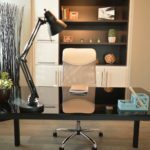 While no one treatment for your office chair is guaranteed to fix all its ailments, there are some basic principles we’ve found that can cure most of your problems. Every office chair is made up of a collection of individual pieces that are screwed together. Most of those pieces, especially those underneath the chair, go through a ton of movement and weight-bearing over the course of the chair’s lifetime. As you lean forward, back and swivel from side to side, parts wear down, screws and bolts loosen and your chair gives off some pretty annoying sounds. In most cases, those annoying sounds are the result of moving parts rubbing against each other because the screws that hold them are loose, or because factory lubrication in certain joints has worn off. There’s a good chance you didn’t put your office chair together, which may be a good thing if you’re not mechanically inclined. However, the fact that you didn’t put your chair together means you weren’t around to make sure everything was screwed together nice and tight. When you examine your chair for loose screws and bolts, it’s best to do it with the chair flipped upside down. The easiest way to do this is stack catalogs or books up to the height of your seat when it’s turned upside down. Turn over your chair and place the seat on the stack. Make sure it’s secure; you don’t want it wobbling or tipping over. From there, use your fingers to wiggle each screw or bolt. Hand-tightening is acceptable, but isn’t a good solution if you want a long-term fix. Once you identify the loose parts, use a crescent wrench or a screwdriver (flathead or Phillips, depending on the screw) to tighten up each screw or bolt. After tightening everything, flip your chair over and go through your normal motions. Still squeaking? Flip the chair back over and double-check that you tightened every screw or bolt – sometimes you’ll find them in weird places you didn’t see the first time you looked over the chair. If you’ve still got a squeak, the problem is most likely found inside of a joint or moving part. Once you’ve given the screws and bolts a good tightening, there’s still a chance you’re going to get a squeak or two. At this point, you need to identify where the squeak is coming from. So, have a colleague sit in your chair and move around while you look underneath and listen for specific sound points. If you can identify where the sound is coming from, use a can of WD-40 to give the area a good spray. Keep a few paper towels around and place them on the floor to catch any excess lubricant that falls to the ground. One of the main culprits of a squeaky chair is the springs which cushion your chair as you lean back. These springs are known as seat-tension springs. You’re going to come across a variety of wheels, but standard wheels are inserted into the body of the chair via a metal post fixed to the top of the wheel. Over time, those metal posts can wear down and become loose and the wheel axles can suffer from squeak-inducing friction. So, flip your chair over and try to remove the wheels. If you can, lay them down on paper towels and squirt them with some silicone spray. Give the metal posts a good squirt, too, making sure to spray inside the post housing. The tips we’ve given here are designed to be simple and time-friendly. You’ll need a screwdriver, a few wrenches and a can of WD-40. If you’re looking for a more in-depth tutorial on how to fix your office chair, we recommend a YouTube tutorial we found by handyman Todd Harrison. It’s a great video if you’re too impatient to wait for a company handyman to fix your chair. In the meantime, look at our post on how to fix a sticky keyboard. We give you some quick, easy tips for what to use to remove your keys, what you need to clean them and more.